A sleek mens Skagen watch made from stainless steel. This attractive men's timepiece is set around a black dial with orange high-visibility numeral hour markers, silver hands and a date function. The watch fastens with a sleek silver bracelet and powered by a quality quartz movement. It is 30m water resistant. Very impressed with speed of ordering and delivery. Watch looks very stylish but as I have bought it as a present for my husbands birthday later this month I cannot review it properly at this stage. I love my Skagan watch so much that I bought this one for my husbands Christmas present. I hope he likes it as much as I do. It is stylish but has a very clear face and numbers. I love this watch. Its very light and half the time I cant tell that I have it on. The dial is very easy to read, and with the titanium case and super hardened mineral glass it should last for a long time. Ill definitely be buying another Skagen watch again! Very nice watch. Slim and light. Only negative would be the dials and numbers dont glow in the dark. I use it as a second watch. I have been looking at this product for a while and after travelling abroad and seeing in Duty Free I decided to order immediately from Watch Shop The price was better than Duty Free, I returned home to find my new watch and am thrilled to bits it looks stylish and I am 100% impressed at the speed and efficiency of Watch Shop. Bought this watch for my partners birthday. Looks very smart. The strap is easily adjusted. Unlike linked straps, it can be adjusted bigger or smaller whenever you want. The thin profile makes it comfortable to wear & it doesnt catch on clothing like bulkier watches. The face is easy to read & not crowded with too many features. In all, a great buy. I really like the thinness of the watch and the colour of the numbers on the dial, it makes it look very stylish. Bought this watch for my husband as an early birthday party as he was buying me a Skagen watch. He absolutely loved this watch. It looks so good on the wrist, slim and elegant, and the orange numbers on black face are so easy to read - important when getting on a little. Watchshop service was excellent. Next day delivery and extremely well packaged. I love this watch, in fact i love it so much i bought another 3 Skagen watches. The style is so sleek & fit perfectly on the wrist. 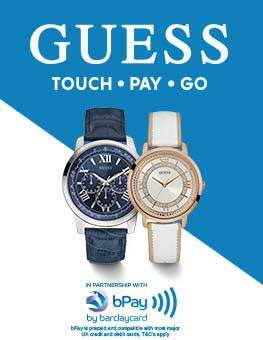 There is nothing i dont like about these watches, I cant believe i did not know about this name before. My favourite colour is the blue but they are all beautiful watches.I feel proud to be wearing a watch this attractive. A fabulous watch. 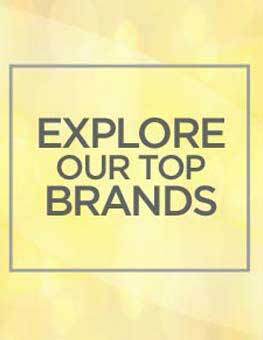 Stylish, quality product. Skagen did not disappoint. Needs a bit getting used to with the clasp but after a few times it works perfectly. A very stylish slimline watch which looks far more expensive than it was. Bought as a gift for my husband. Excellent watch, great value. Wanted for a long time then bargain appeared-great! I was very pleased with both the service of delivery and the item received. I am certain that my husband will be very pleased with his gift on Christmas day. The only downfall which was my own mistake, was not having the watch band sized before receiving the item. Bought this item for my boyfriend online and I was amazed with the service I received from The Watch Shop. The Watch was over £40 cheaper than the official Skagen website which I was originally going to purchase off and the watch was delivered within 24 hours of purchase for free. Very impressed! Cant wait to give it him at Christmas! 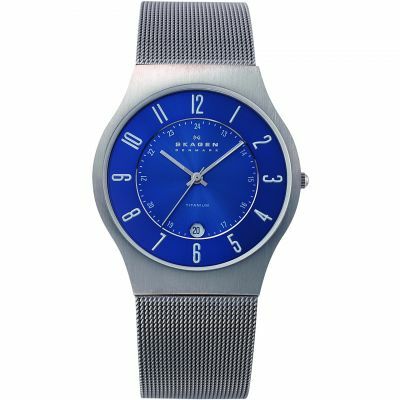 Really good-looking watch, I have been buying ladies skagen watches for several years now but this is the first gents I have bought, Impressed with styling and your quick service. This Skagen watch has no bling about it, just elegant design and functionality and in sunlight the titanium case shines with an understated dazzle. The large orange numerals are easy to read the date however is very small, especially when the date enters two figures. The diameter of the watch is just right for me as I didnt want a large dial. The strap, like the watch case, is also elegant and wraps around the wrist neatly. This Danish design is minimalist and discerningly sober for the well dressed wrist. The watch is very slim and light making it easy to wear all day. The strap is very easy to adjust and the double catch makes it secure. The silver hands, red second hand and orange numerals on the black face make it easy to see the time at a glance, but the date number is very small and hard to read. Overall a very good quality watch and good value for money. I bought the watch for my husband, who I might add is very fussy when it comes to buying things. He loves the watch,the colour, it looks smart, and sophisticated. i The clip on the watch is very difficulty to do up. Not a watch you can put on your arm when you are in a hurry. II The other comments is that the dial on the right hand side is quite sharp and is uncomfortable against your skin. A beautiful watch.The style is very simple and flat. Its really well made. Bought as an eighteenth birthday present for my nephew. Very suitable for a younger man with slimmer wrists, and the strap is adjustable. A much better design and superior workmanship, than other brands in the same price range and it has a lifetime guarantee. The watch is sleek and slim, perfect for someone who doesnt have the chunkiest wrists. The face is clear and easy to read. The face is slightly smaller in circumference to other Skagen watches I have, but its still an attractive watch. Adjustment of the strap is very easy, and the clasp is solid and reliable. Id buy this watch again. Wonderful gift, high quality, beautiful gift wrapping. Excellent service. Chose as a last minute surprise for my husband and he was delighted with it. I would highly recommend this supplier. A beautiful time peace. Bought for Christmas for my husband. He loved it, thin face and sleek strap. Beautiful for that special occasion. Packed wonderfully and arrived on time. Would recommend to friends. A great watch at a great price. What else could you ask for. Love love love it. Arrived promptly and price of watch very good . Its a beautiful watch which I would highly recommend . Great watch, slim profile very comfortable on the wrist. Doesnt snag on sleeves, cuffs etc. keeps perfect time and the orange markers are a nice contrast against the dark face. All in all a good buy. Timeless classic, slim and elegant. Comes in a multitude of finishes, all quality. 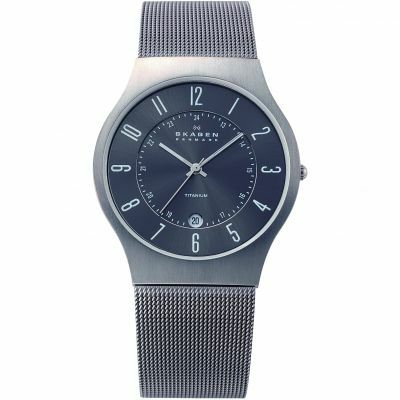 Skagen have gone against the trend for big, bulky watches with a plethora of dials and buttons by producing a slim, elegant watch that sits nicely on the wrist and doesnt feel like you are carrying a half brick on the back of your hand. The finish and quality are excellent with a bright, crystal clear glass that still combats reflections so that the dial is visible in all light conditions. The combination of the titanium grey band and case, with the charcoal face and orange numbers is both restrained and striking, and certainly unusual. All in all a classy and refined timepiece that is understated but at the same time says a lot about the wearer. I always liked Skagen Watche. I bought this lone for my dad. He loved it as its an everyday watch but with style. Really thin watch. watch is over all good but looks bit dull than the pictur. Delivery on time that was very good. 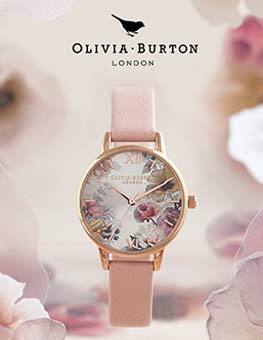 These are beautiful watches and when my partner saw it in a shop window instantly fell in love. I ordered from The Watch Shop just before 2pm on a Thursday and it was delivered next day before 10am - standard delivery! I was a little nervous ordering a special item such as this online but I was very impressed with the entire service, the watch was delivered in impeccable condition. 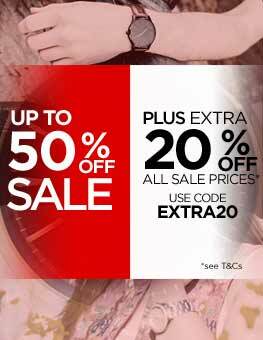 I would definitely recommend The Watch Shop and will certainly shop again! Great watch this is 7th skagen I have purchased. So comfortable and stylish.will be back to buy more great service too. I bought this watch for my fiancés 30th birthday. He doesnt usually wear a watch because he finds them to big and bulky but this watch is different its so thin and light weight because its titanium he hardly knows hes wearing it. The face on this watch is very clear its altogether a very nice looking watch! My husband and myself are watchaholics and he has a range starting from the very basic everyday watch up to mid range and top end with a Cartier. It really doesnt matter as we just buy if we like something about the styling. This watch, for instance, he just fancied for its slimness and simplicity, and particularly that it looked a bit different with its orange details. So I bought it him for his birthday. He enjoys wearing it very much and I must say it does look very stylish. Yes, happy with the product and it is shown very clearly on the wonderful website should you consider purchasing it. 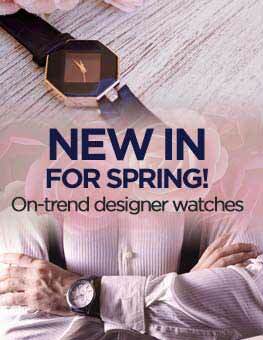 Lovely watch - elegent lines contemporary and classic a tthte same time. I am rather jealous tha tI don't have one myself! The watch is being given as a present and I am delighted with quality and workmanship. The slimness of the watch and the clear crisp lines are extraordinary. The watch face is clear and the coloured numerals make it very easy to see. This is the 3rd Skagen watch I have purchased and have been delighted with all three. 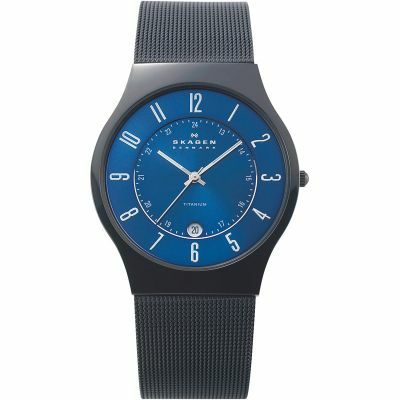 I find the Skagen style - thin profile, slightly minimalist, but practical - very appealing. I like numerical faces so I chose this one, with orange markings which stand nice and bold on the black background. The watch case and bracelet are lightweight but feel substantially made. It comes in a cute box where you find guarantee/instruction manual and a little 'cushion' around which to strap the watch safely when not in use. Everything says quality, and this product matches my expectations of Skagen in every way. lovely watch, very light and stylish. It will be perfect for my dad's christmas present. Shipping was fast, and a great price that beat the high street too.